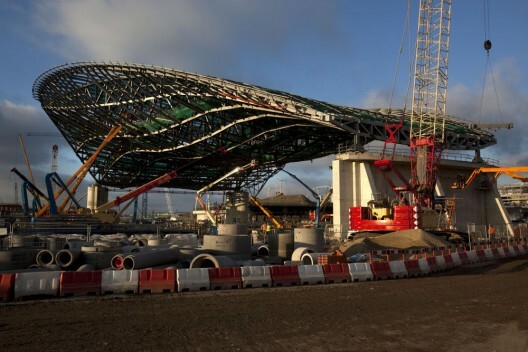 The 160m long wave shaped roof frame for Zaha Hadid’s Aquatic Center has just been lifted and lowered into place, marking one of the most complex engineering and construction challenges of the Olympic Park for the London 2012 games. Weighing in at over 3,000 tons, the gigantic steel trusses rest on a mere three concrete supports to provide open space for the facility’s large racing and diving pools. 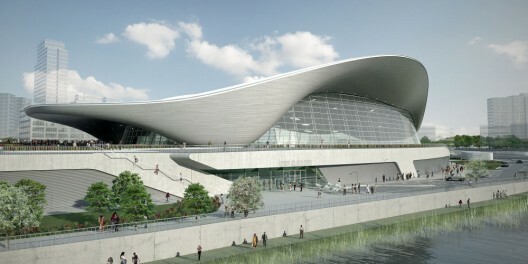 The roof is also designed to stretch, twist and contract in response to the effects of snow, wind and changing temperatures. 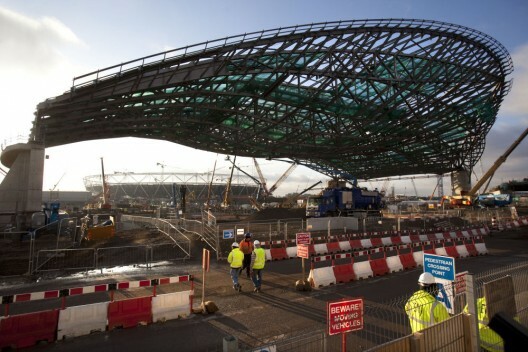 Fabricated in Newport from plate rolled in Gateshead, Motherwell and Scunthorpe, the steel framing was assembled on site and connected 20m off the ground on temporary supports. 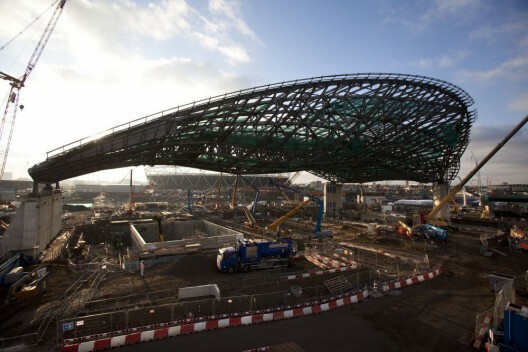 The completed roof frame was then carefully lowered into its permanent position and the temporary supports were removed in phases to enable work to continue beneath the roof, namely, the excavation for the venue’s two 50 meter swimming pools and 25 meter diving pool. The Aquatic Center is right on schedule to be finished in the summer of 2011. 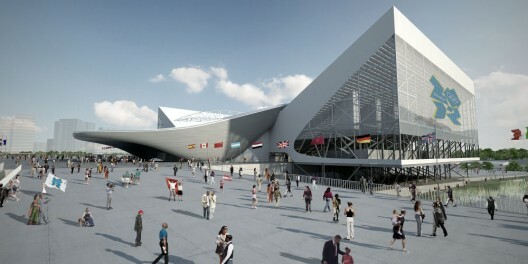 In a few months, work will begin on the aluminium roof covering. After the aluminium, the 12,000 sq m ceiling will be clad in Red Lauro timber, a sustainable sources that will combine the required level of durability and visual impact. As seen on World Architecture News.